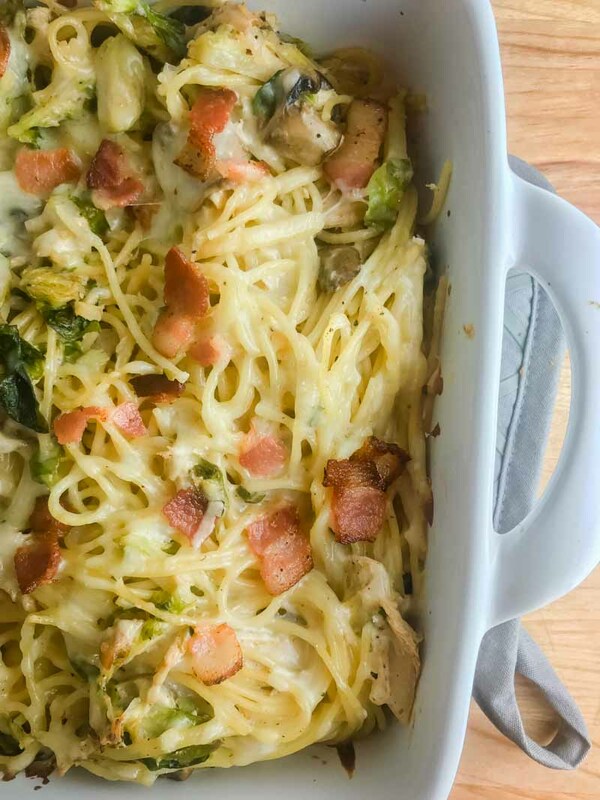 Use your leftover turkey to make this creamy Baked Turkey Spaghetti. 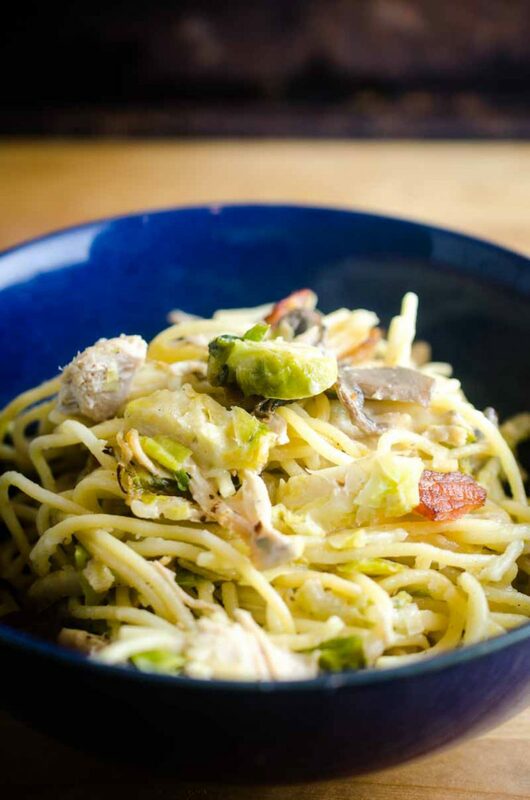 Loaded with shredded turkey, brussels sprouts, mushrooms, bacon and cheese. Leftovers are always one of the best parts about holiday meals, am I right? 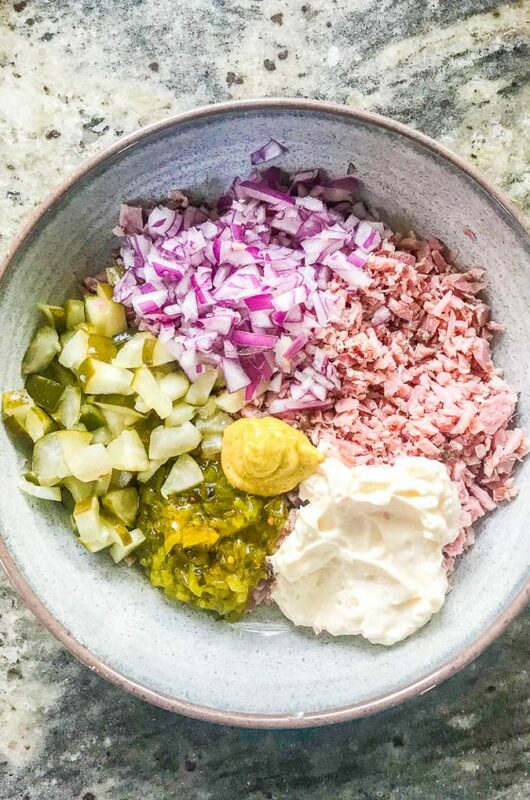 As great as simply reheating a plate of leftovers is, it’s also great to repurpose them and make an entirely new dish. I love turning mashed potatoes in to these Cheesy Mashed Potato Balls. Or using leftover turkey and chicken to make soups. This Baked Turkey Spaghetti is my latest creation and judging by number of second helpings, I think it’s a winner. I am on a personal mission to make everyone love Brussels sprouts. Despite the bad things you may have heard, Brussels Sprouts are pretty delicious. I’ve roasted them with cajun seasoning. Put them in a cheesy dip and even made them into kebabs. Like I said, I’m on a mission! Now, I have added them to this Baked Turkey Spaghetti. Along with shredded turkey, mushrooms, bacon and cheese. 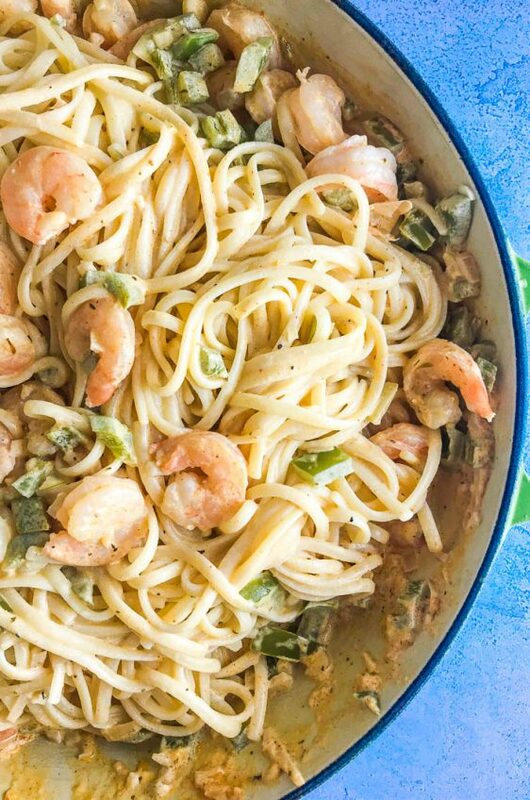 It is a quick and easy meal that the whole family will love. I have been seeing baked spaghetti popping up all over pinterest for the last few years but I had yet to try it. 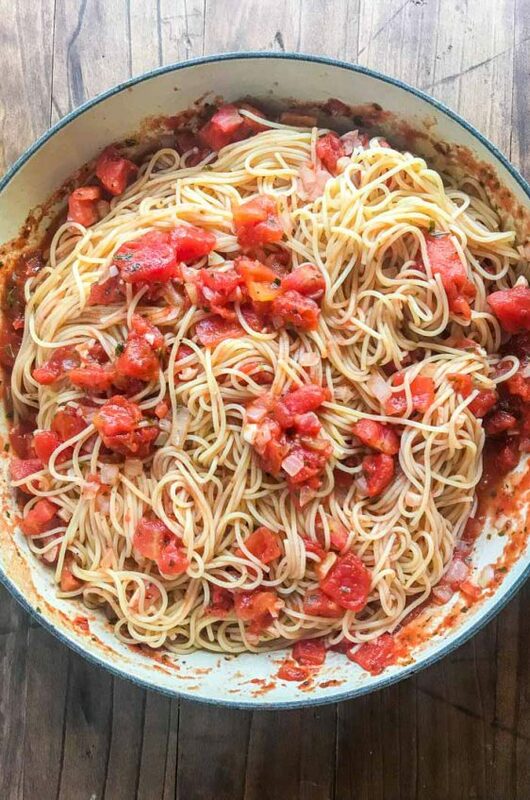 Sure, I use short pastas in casseroles, but I’m not sure why I never used spaghetti before. 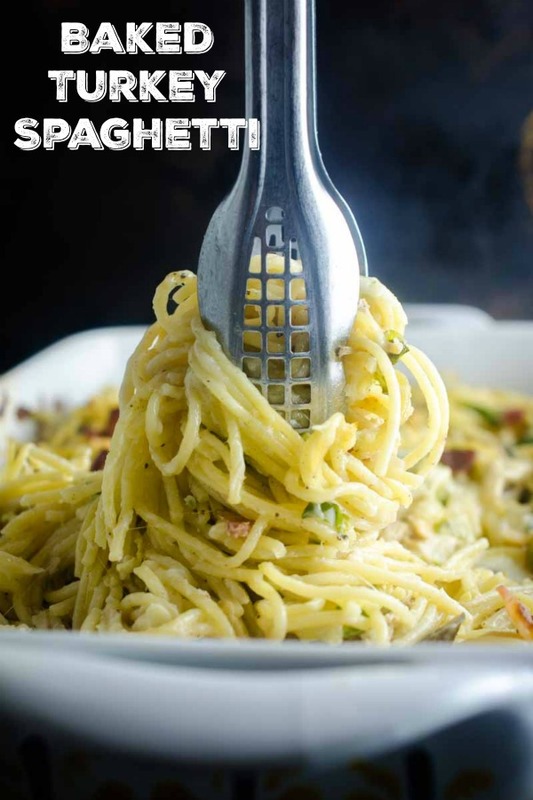 Usually when I cook spaghetti, I leave it whole but for this recipe, I break it in half. I find that it works better in casseroles. Tip number two is to slightly undercook the pasta. 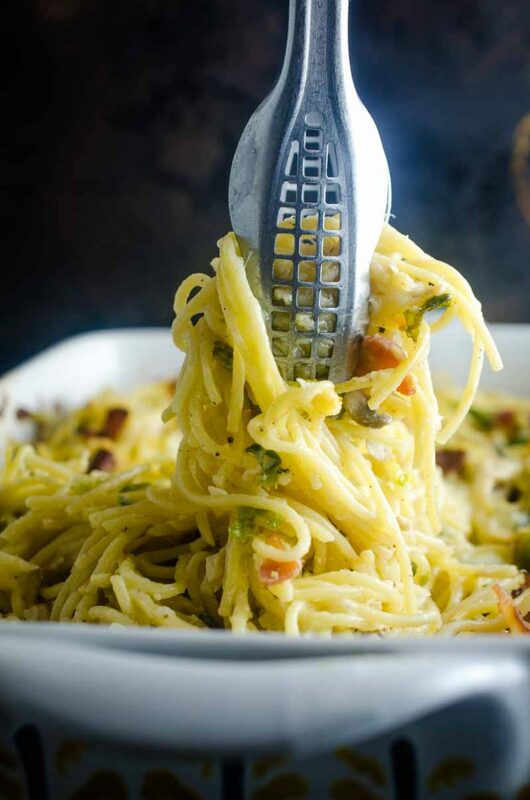 When you are boiling the pasta, you will want to cook the pasta until it is still slightly chewy. And then, after it has boiled, run it under cold water to stop the cooking process. Doing both of these things will help prevent the pasta from becoming over cooked when you bake it. One of the great things about this, and any other casserole really, is that you can make changes for whatever you have. Don’t have turkey? Use chicken. Use pancetta instead of bacon. 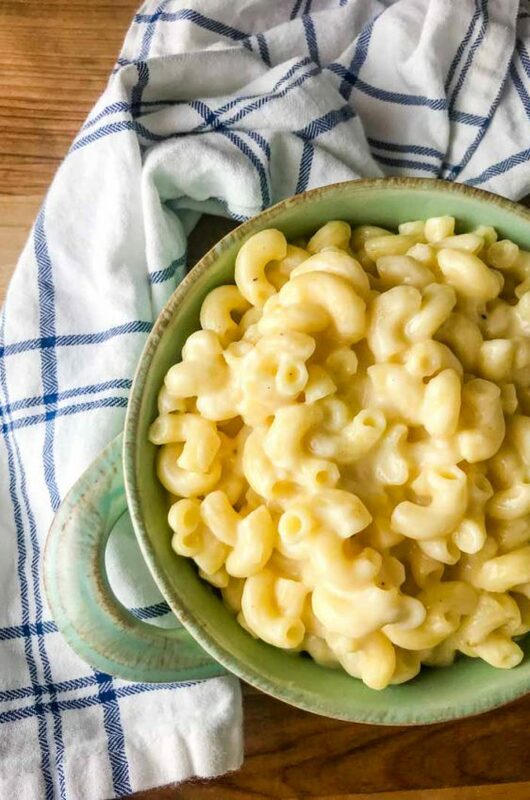 Use mozzarella or provolone instead of white cheddar. Use broccoli instead of Brussels Sprouts (although you should really try the brussels sprouts! See above about my brussels sprouts mission). 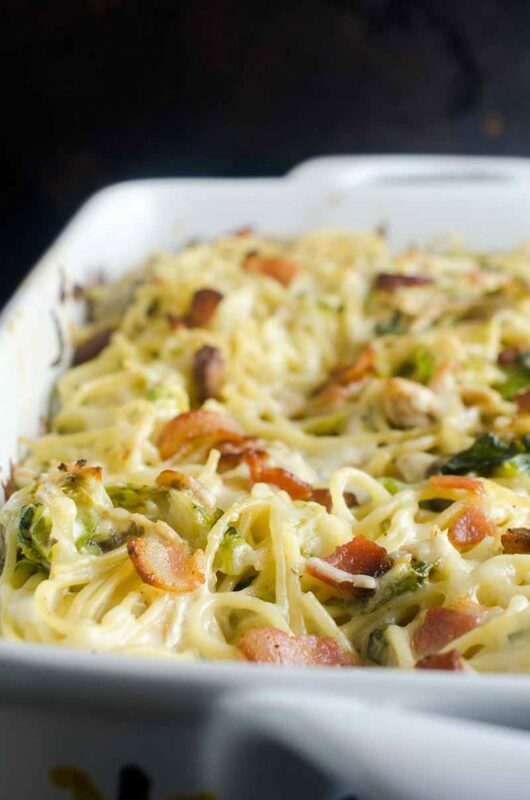 Whatever you choose, baked spaghetti is sure to become a family favorite! Cook pasta according to package directions. Drain and run under cool water to stop the cooking. Drain completely. 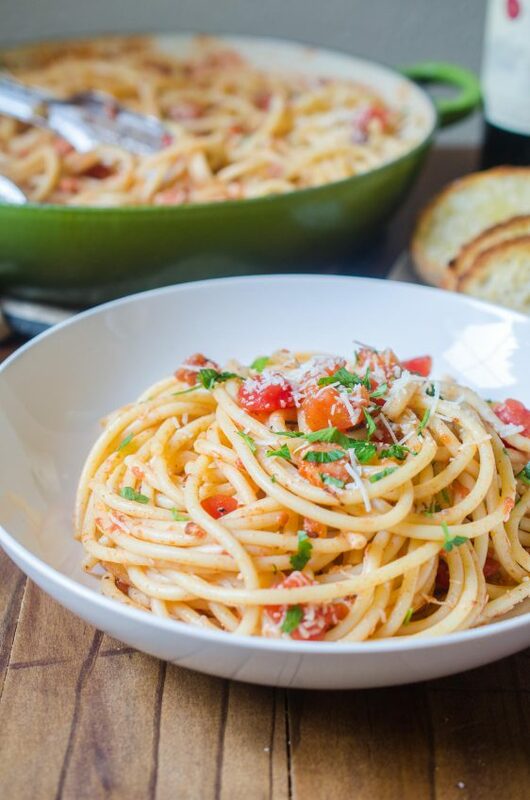 While pasta is cooking, cook bacon until browned. Use a slotted spoon to transfer to a paper towel lined plate. Reserve pan drippings. Add brussels sprouts, mushrooms, shallots and garlic to reserved pan drippings. Cook just until vegetables soften. Add in shredded turkey. Pour in chicken broth to deglaze the pan. Scrape up any brown bits that have accumulated at the bottom of the pan. Slowly whisk in milk. Add in cream cheese and continue cooking until cheese has melted. Stir in cooked pasta and toss to coat. 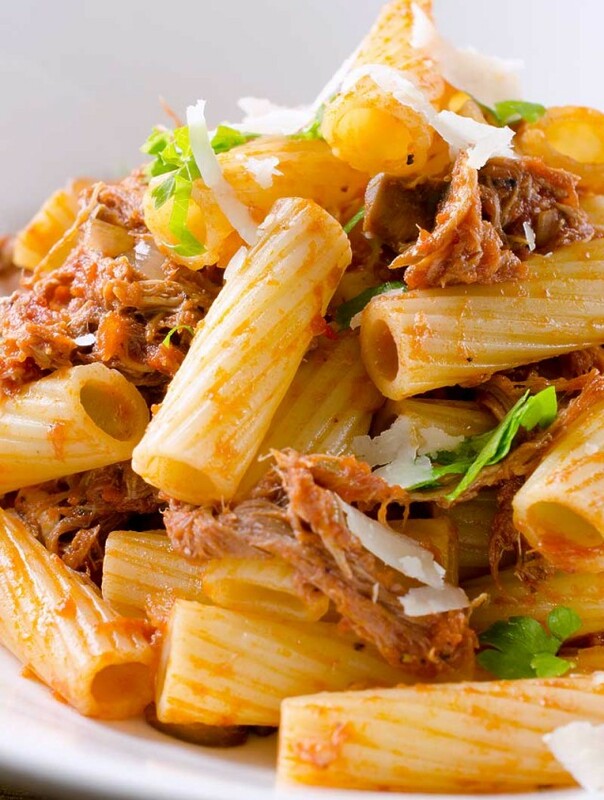 Place pasta in a large casserole dish. Sprinkle with white cheddar cheese. Bake for 15 - 20 minutes or until cheese has melted. Top with bacon pieces. Serve. 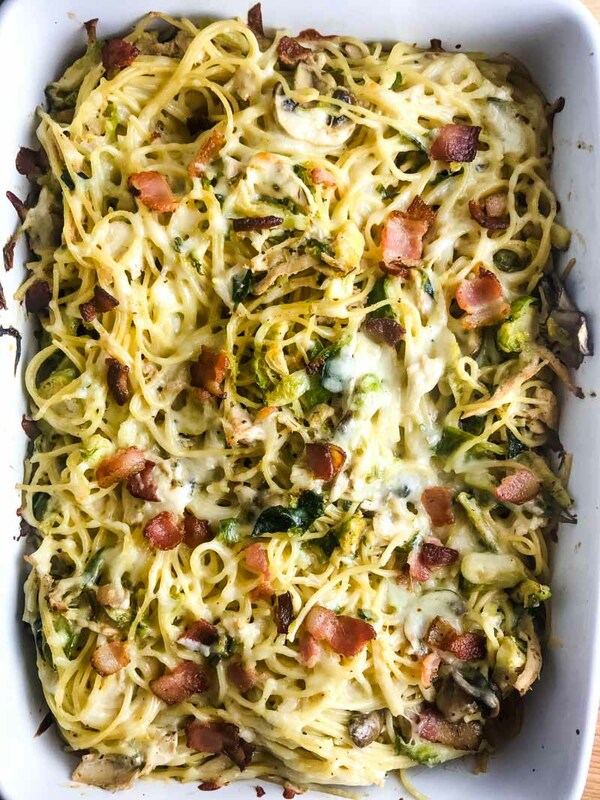 baked spaghetti is one of my favorite easy meals! Great way to use any leftovers that you might have in the fridge still! What a great way to use leftovers! This looks tasty for sure! This sounds perfect for all the leftover turkey I have sitting in the fridge! I love making this for my family. They cannot get enough of it !! What an excellent use of the leftover turkey! This sounds delicious! Your variations also sound delish!